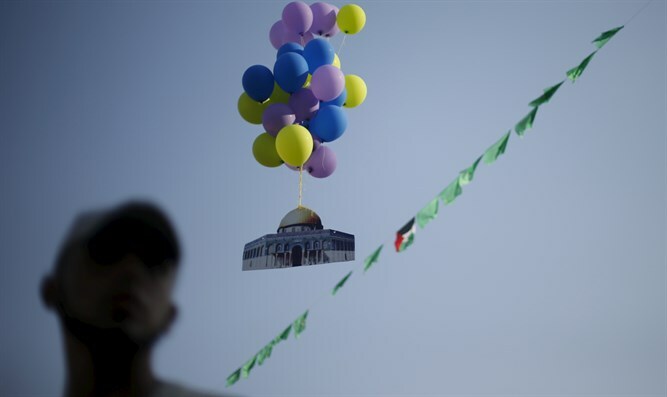 Two explosive-laden balloons sent into Israel by Gazan terrorists explode in Jewish border town. Two explosive balloons sent from Gaza into Israel exploded on Monday evening near Eshkol Regional Council homes. The attack comes just hours after the IDF attacked a terror target in central Gaza in retaliation for a previous round of explosive-laden balloons. According to the Eshkol Regional Council, no one was injured and no damage was caused. On Saturday night, the IAF attacked a Hamas position after explosive balloons sent from Gaza were found in Israeli territory. Last Wednesday, an explosive balloon from Gaza damaged an Israeli home when it exploded. The Israeli Air Force responded by targeting several Hamas military outposts in southern Gaza.